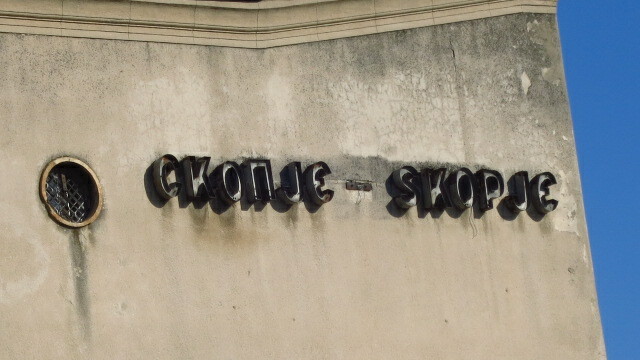 To Skopje or not to Skopje? A week ago, while we were in Dubrovnik, we had heard news that a flash flood had affected Skopje, leaving at least a dozen dead, over 60 injured and damaging the roads in and around the capital, and that the government wanted to declare a state of emergency. 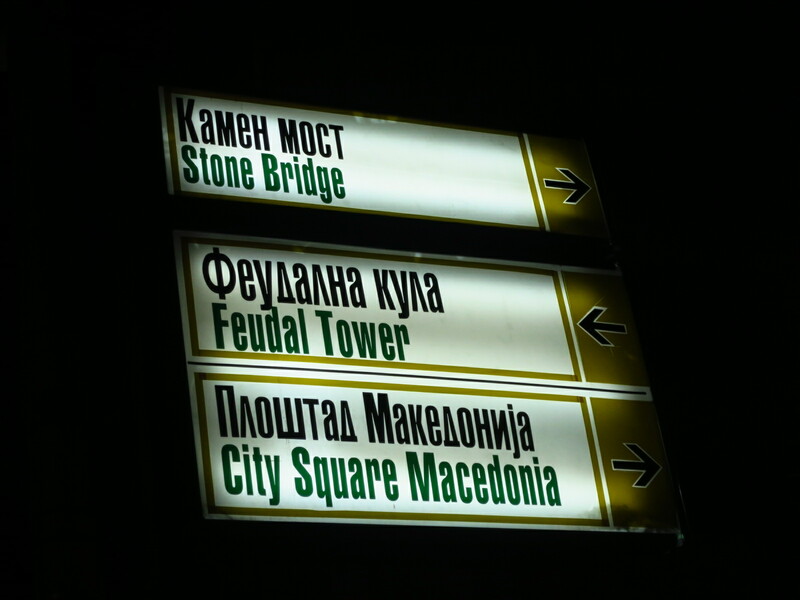 After that the news in international outlets went quiet about the matter and the time came for us to make a decision whether to go there and spend two days as planned or skip Macedonia and go on to Bulgaria. 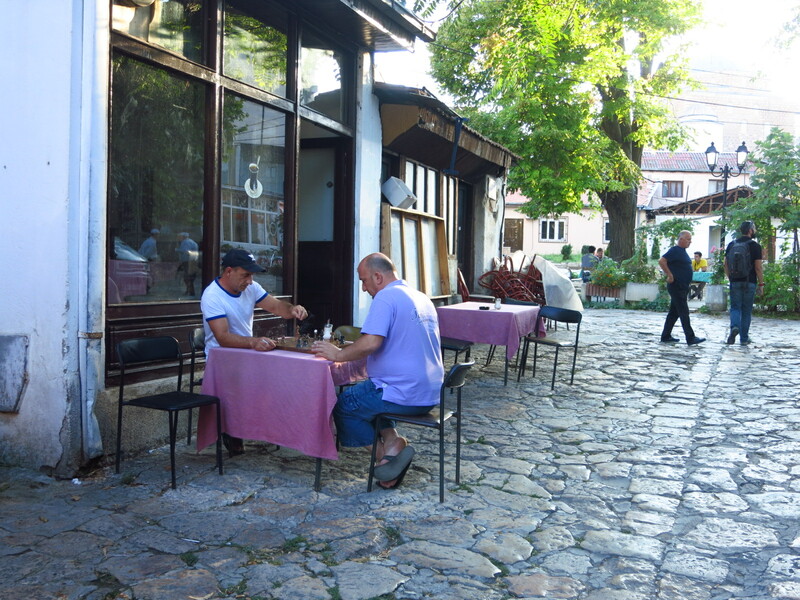 We had a booking for two nights in a hostel in Skopje, so we wrote to our host to ask about the situation, and he promptly sent us a reply assuring us that there was no problem in the city nor in the roads leading to it. Instead of leaving Prinzen on the main road to Pristina and then turn south towards Skopje, we took the R115, a small regional road that followed a canyon starting right behind the city fortress where we had seen the sunset and then climbed to well above 1000m through the Malet e Sharrit natural park. On the other side of the park we joined the main road from Pristina to the border, where we found a lot of traffic and an endless queue at the border crossing. 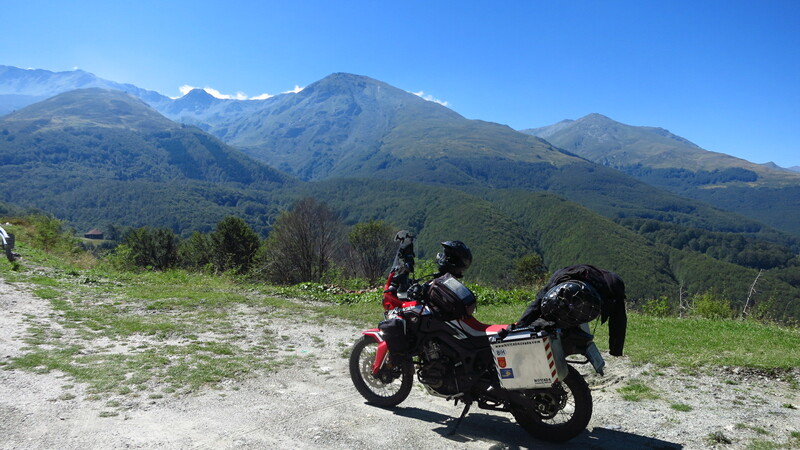 After that the ride to the capital was quite fast and uneventful, but the first impression I got from Macedonia was the worst so far these holidays – after everything we had seen, the landscape was featureless here, dusty and scorched by the sun, with scattered factories and warehouses here and there. At least the traffic was good, and funnily enough we entered the city and rode to the hotel practically without stopping. Not bad for the only capital city we have visited so far. My bad first impressions went out the window the moment we entered the hostel and met Goran, our host. He let me park the motorbike inside the house garden, offered us a much better room than the one we had originally booked (which was the cheapest one, we are travelling on a budget) with no extra charge and gave us a very comprehensive explanation of the best things to see in and around the city, with recommendations for the best bars and restaurants included. Having absorbed all that information, and after a shower and some lunch, we went to visit the city. 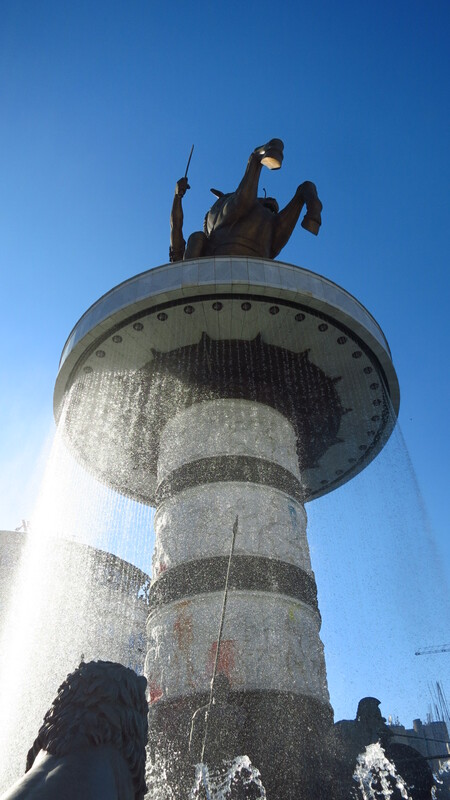 Skopje turned out to be rather more interesting than I was expecting – it gave me the feeling of a city in a state of flow, quickly transforming itself, and it seemed to have a bit of several different cities thrown together in the same place. Walking from the hostel to the centre I saw Warsaw as I imagine it must have been some years ago, with big grey buildings left from the communist era and empty today, waiting to be torn down or renovated, half of the building that used to be the main train station already demolished, the other half hosting the city museum, and the old rail yard, shorn of its tracks, waiting for its future use. I saw Berlin in the frantic pace of construction in the centre, modern buildings creating new city centres. 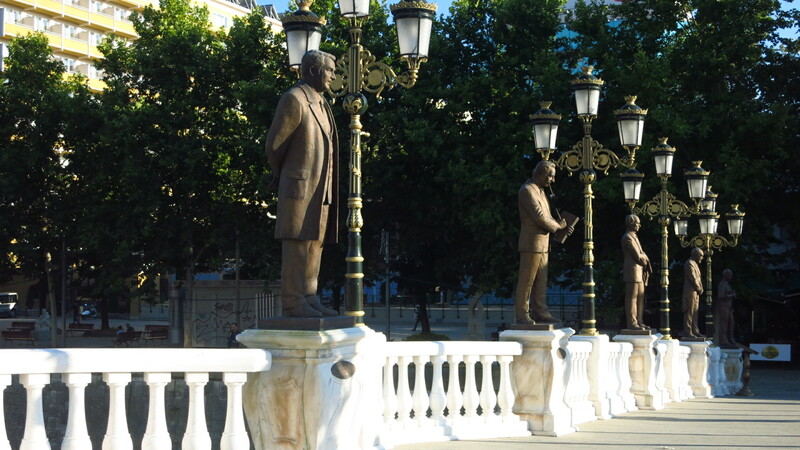 I saw a wink to Prague in the many statues that lined the two new pedestrian bridges and the river banks in a homage to the most prominent figures of the Macedonian arts, culture, education, politics and religion. I saw Sarajevo in the old town, walking along cobbled streets lined with tiny wooden storefronts, men sipping tea in street cafés and the sight of a mosque rising above the tiled ceilings. 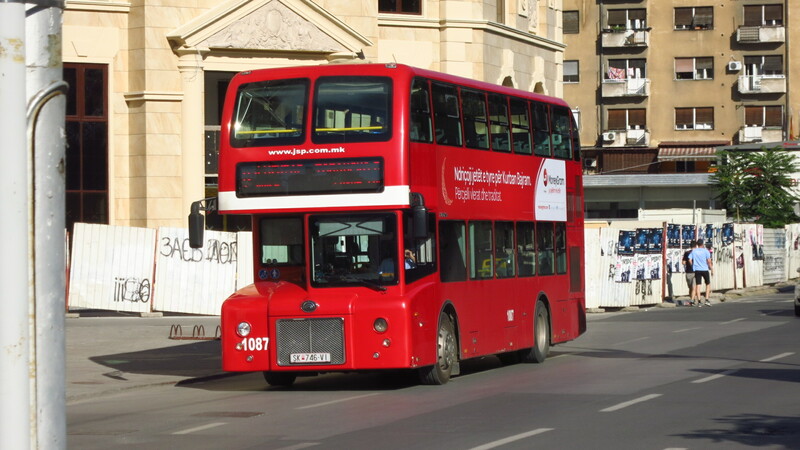 I even saw a tiny bit of London in the red double decker buses that run around the city. We took all this in, we knew absolutely nothing about the city and we arrived here with no expectations or pre formed notions, so we were blank canvases for the city to paint itself on us in its purest form. 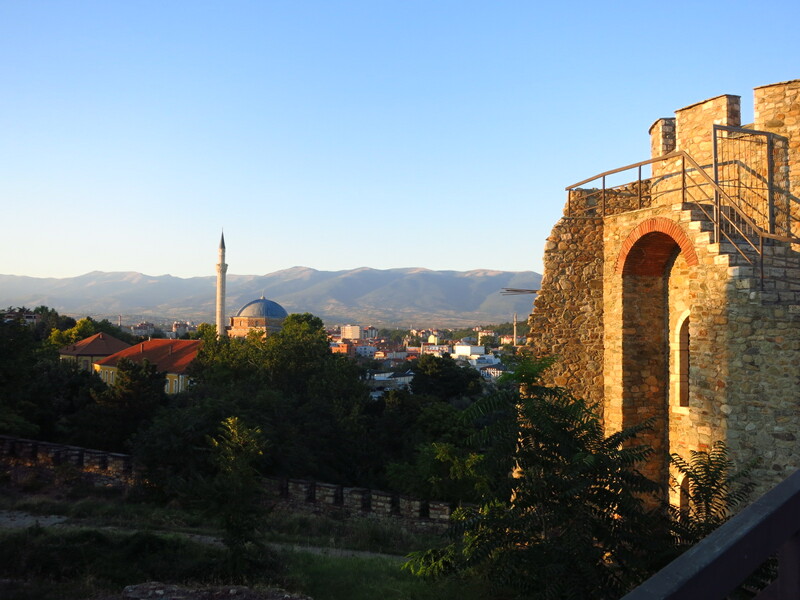 We gazed at another sunset form another old fortress and then had an absolutely delicious traditional Macedonian meal at a restaurant Goran had recommended. I have always said that each and every capital city has its own very strong personality, and this was no exception. We strolled back to the hostel leisurely, glad that we had decided not to skip the visit. 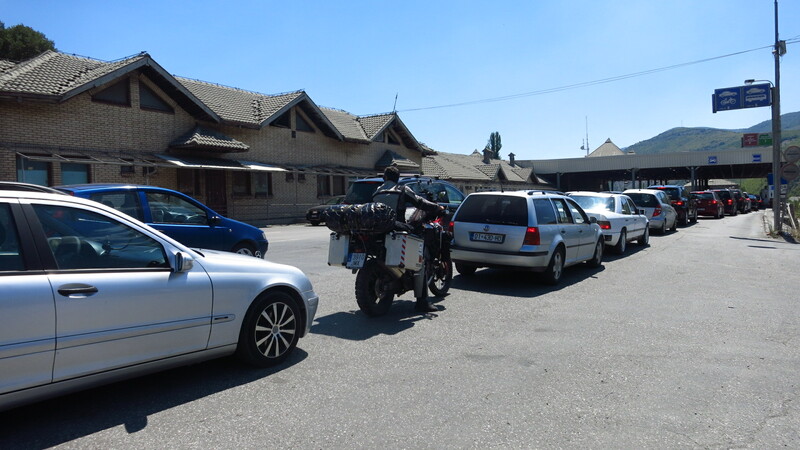 This entry was posted in Balkan Adventure 2016, Travel and tagged floods, Honda CRF 1000L, Kosovo, Macedonia, Prizren, Skopje by Kilian. Bookmark the permalink.